We still hadn’t got used to the size of France and this was in evidence when we moved on from Ile d’Oléron; Arcachon was the target for our next stop, but at slightly over 100 miles away it was a lot further than we’d envisaged when we looked at the map. The route included a massive inland detour to navigate past the Gironde estuary – the largest estuary in western Europe – and Bordeaux – a city that’s on our to-do list for another time. 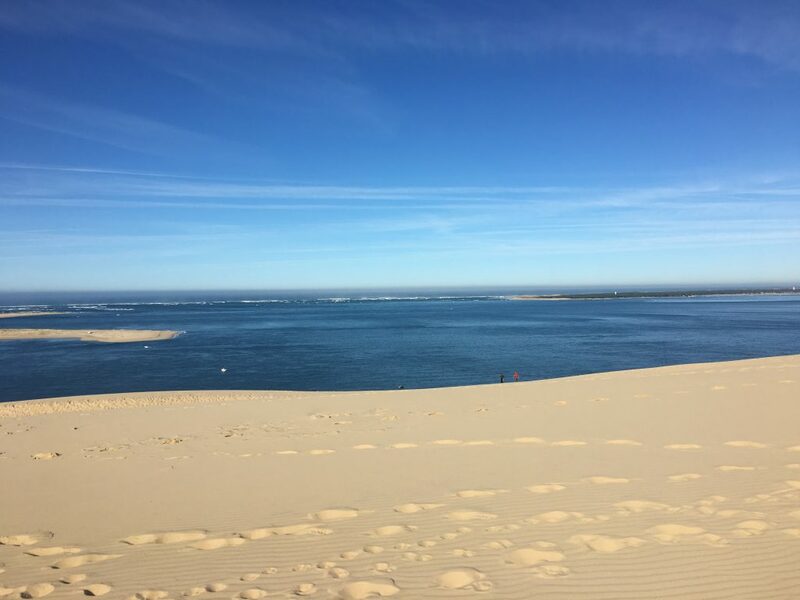 We arrived in Arcachon in mid afternoon and navigated through villa lined roads and over the golf course to find our parking spot on the road between the main town and the suburb of Le Moulleau. 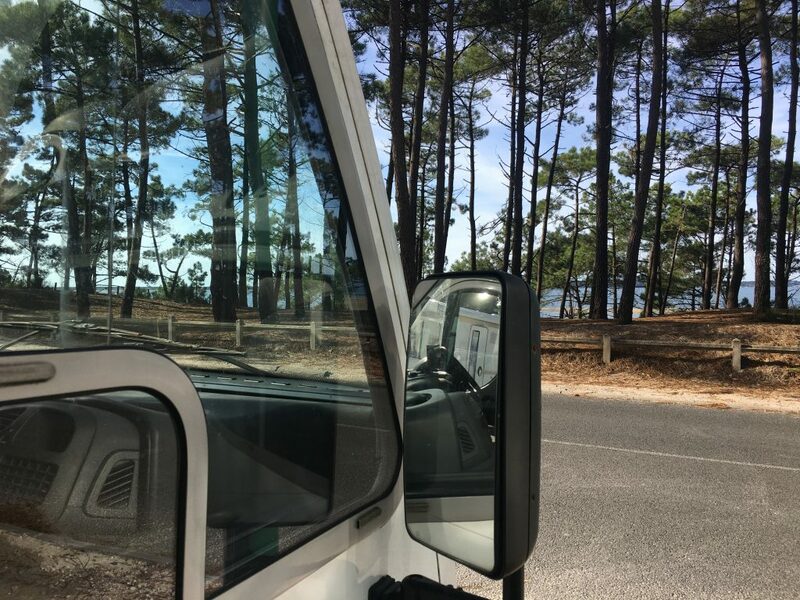 Both sides of the road were backed by pine trees and our view from the front of the van included glimpses of sea and sand between their trunks. The sun was shining fiercely in the sky and we were experiencing temperatures we hadn’t felt since we were in Wales in June, it felt as though we had finally found summer. Any major exertion was off the cards due to the long drive and the sunny weather but we got the bikes out for a short cycle into Arcachon resort. 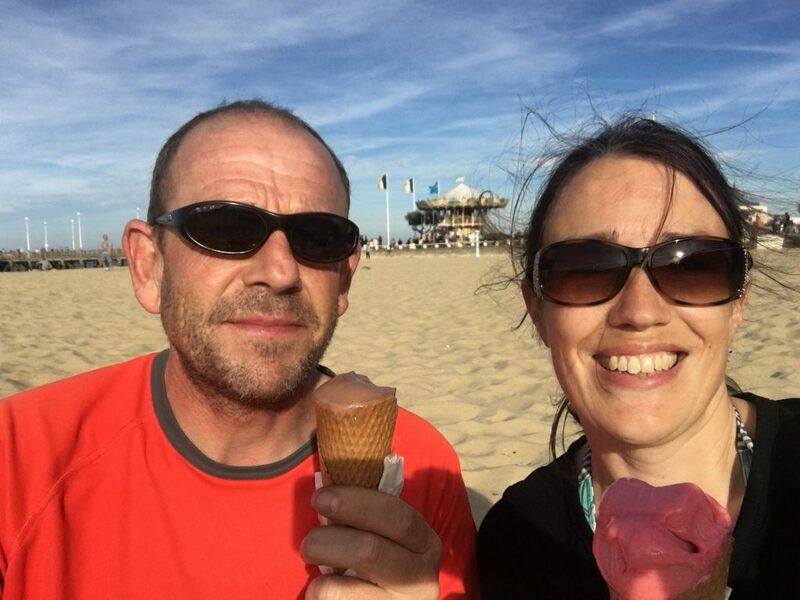 There were plenty of people promenading along the long seafront and around the harbour, we relaxed in the holiday atmosphere – slightly less frenetic than at the height of summer – and treated ourselves to an ice-cream before cycling back to Bertie. The following morning we cycled south to visit the main tourist attraction in the area. 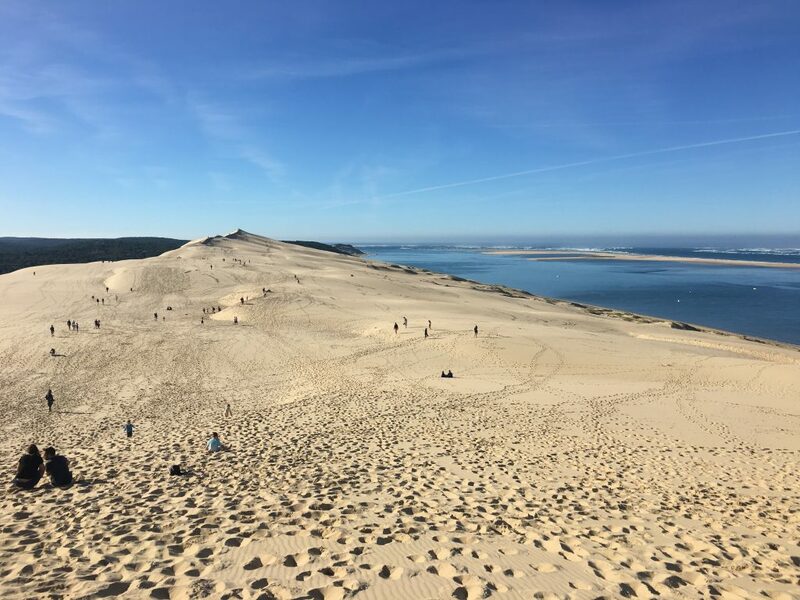 The Dune du Pilat (or Pila, or Pyla) is the tallest sand dune in Europe at over 100 meters (it’s height varies) and nearly 3km long. It’s obviously a major draw with large car and coach parks and an avenue of tat stalls and fast food booths to snare the tourist. There is even a set of steps that can be used to climb to the top of the dune if you find slogging through the sand too much effort. 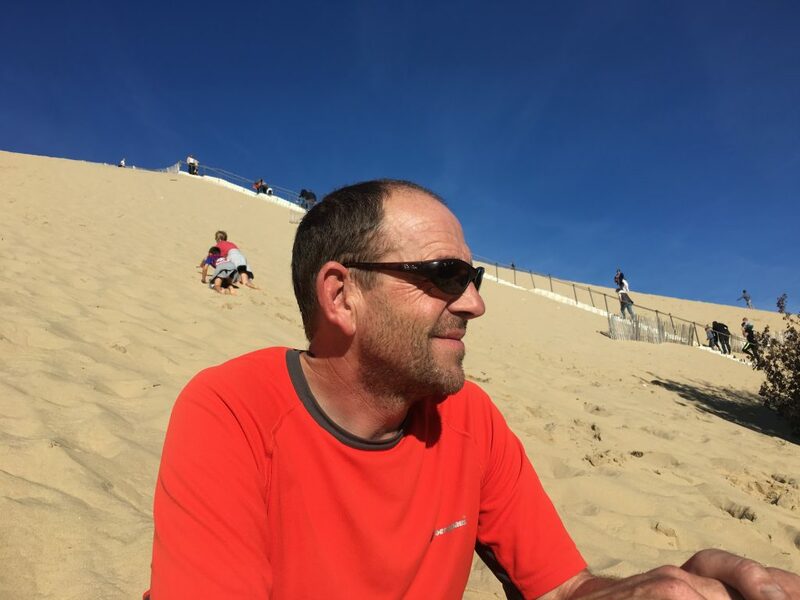 In fact Paul took one look at the dune and decided it was too much effort to even start the walk and sat at the bottom while I made my way up (not using the stairs), feeling like I was on the ski slopes with the sand shifting and sliding underfoot. From the top the views were incredible, out to sea was the Banc d’Arguin nature reserve and beyond it the Atlantic surf made bright sliver lines across the horizon, along the ridge of the dune there was a string of tourists, thinning out at the furthest extent of the ridge, to the north you could see the sheltered Bassin d’Arcachon with the peninsular of Cap Ferret protecting the bay. I spent a little time taking in the views and walking across the wind-firmed sand on the crest of the dune before cutting back down the side of the dune where the sand was softer. By the time I was back with Paul my trainers were full of sand and I felt a good inch taller. Apparently the sand dune is moving inland and swallowing up trees and infrastructure as it goes – it must be a slow process but it cant be helped by hundreds of people emptying sand from their shoes in the car park. From the Dune we cycled further south along well marked cycle paths and past closed camp sites until we reached the first spot where it seemed possible to access the beach without climbing over the massive sand dune. At Le Petit Nice there was a large forestry parking area with picnic benches and other closed facilities. Large areas of dune were fenced off to protect the fragile habitat leaving a causeway for access to the beach. Down on the beach the water was calm as were still sheltered by the Banc d’Arguin off-shore but we could see and hear the pounding surf on the other side of the sand bank. I took advantage of the calm waters to have a swim while Paul paddled and we watched large groups of small children being herded by barely older supervisors obviously on a day out with their school holiday club. Once we’d had enough of lounging on the beach we returned to our bikes and cycled back to Bertie. We’d noticed on our bike ride that we seemed to be bridging a gap between two main types of cyclists in France – we’re not the lycra clad, tour-de-france emulating ‘serious’ cyclists, but neither are we the basket wielding, upright sitting ‘everyday’ cyclists wearing their smart clothes and using their bikes to get from A to B. Compared to the first group we felt heavy and slow, compared the the second we were scruffy and sweaty. Oh well – we had enjoyed a lovely summers day out and were ready for a shower, a couple of drinks and a lazy dinner in Bertie watching the sun go down through the trees. Oysters on the Ile d’Oléron?